VedicMaths.Org - 78 - Why are there 16 Sutras? 78 - Why are there 16 Sutras? 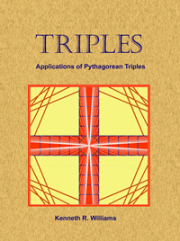 This issue's article is from Robert McNeill who has taught mathematics for over 40 years to students aged from 5 to 18. He is currently Headmaster at St James Independent School for 3½ to 11 year olds in Stockport, UK. WHY ARE THERE 16 SUTRAS? The question sometimes arises as to why there are 16 sutras? The first obvious answer may be perhaps this is just how many are needed to cover the whole range of mathematics. But could there be some other significance? Aisvarya (empowerment), dharma (law), yashas (fame), prosperity, knowledge and discrimination. It is said that Krishna manifested all 16 shakti whilst Rama is said to have manifested seven. Apparently, even one would give rise to a Shakespeare, an Einstein or possibly a Jagadguru (world teacher) such as Bharati Krsna Tirthaji. Monier-Williams, in his Sanskrit to English Dictionary gives further examples such as kanti (beauty), daya (sympathy), tushti (contentment). In verse 10 of The Secret Of The Three Cities the 16 svara are shown to be placed in a chakra diagram and are said to relate to the tithi i.e. the phases of the moon. In the commentary, it is explained that the phases of the moon are 15, characterised by waxing and waning, with sadakya ( literally, "said always to exist") being without waxing and waning, is the cause of the other 15. The number 16 also occurs as one of the most common Sanskrit chanting metres known as the sloka or anushtubh metre. This is the main metre found in the great epics of the Mahabharata and Ramayana. In this form there are two lines of 16 syllables each, making up four padas of eight syllables. There are very precise rules for the accents within the 16 syllables but once again the number 16 is the key. As a further example, it is interesting to note that, in Hindu money, there are 16 annas equalling one rupee and the reader may enjoy Bharati Krsna Tirthaji's chapter on Practice and Proportion in his text Vedic Mathematics. Thus we see that the number 16 occurs in astronomy, in metre, in the science of pronunciation and other areas. We get a sense of the unity through the great tradition covering several aspects of the Veda and Vedanga. Arguably however, the most profound and certainly the most ancient of the references to 16 in the Vedas is found in the Prashna Upanishad, part of the Atharva Veda. "Prashna" means "question" and there are enumerated six questions on the nature of the Brahman. The final and last question asked is about a Vedic divine being called "Shodashakala Purusha" or "Person with sixteen divine attributes". Pippalada answers that Shodashakala Purusha is within the body and explains its greatness and says "So far do I know this Highest Brahman, there is nothing higher than it". The skin giving lustre (as distinct from the sense of touch) and the Pranah (breath) which holds everything together as a string in a necklace. Shankara in his commentary on the Prashna Upanishad points out that whilst the Purusha (the divine person within all) appears to consist of 16 parts nevertheless it is one, totally attributeless and non-dual. So, according to the Atharva Veda, the number 16 is at the heart of all beings in the creation. Therefore it isn't surprising that its manifestation in so frequent and maybe Bharati Krsna Tirthaji himself came to know that Purusha through long years of study and personal discipline in the forest. Brian McEnery is in the process of publishing material on the development of an animation system for teaching mathematics. "CHILDREN 'OVER-RELIANT ON CALCULATORS' IN MATHS LESSONS"
1, 1, 2, 3, 5, 8, 13, 21, 34, 55, 89, 144 . . .
in which each number starting with the third one is the total of the two previous numbers (e.g. 13 + 21 = 34). Many remarkable properties of this sequence have been discovered, including amazing connections with nature. Here is one which seems to be new. 1, 1, 2, 3, 5, 8, 4, 3, 7, 1, 8 9 . . .
Now subtracting each digit from the next digit you get the digit sums of the Fibonacci sequence again! 0, 1, 1, 2, 3, 5, 8, 4, 3, 7, 1, 8 9 . . .
That is: 1-1=0, 2-1=1, 3-2=1, 5-3=2, 8-5=3, 4-8=5., etc. How do we get 4-8=5? Since this is digit sum arithmetic you can use the 9-point circle and count back 8 units from 4 to arrive at 5. Or, since 4-8=-4 you can add 9 to -4 to get 5. This property does not seem to apply to any other sequence I have tried. Can you find one? SEMINAR IN MANCHESTER, UK - "MATHS WITHOUT TEARS"